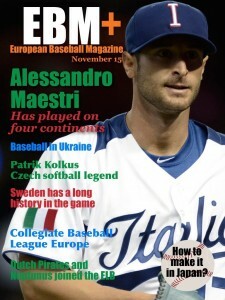 European Baseball has the brand new digital magazine. It offers the hottest European baseball topics for fans, players, people who are actively involved in baseball associations and all who are intrested in European baseball. – The launch of European Baseball Magazine was a success. There is certainly a need for this kind of a magazine. We already have partners in several European countries. Ukraine is perhaps the most exotic baseball country where we have avid readers. The most distant contacts come from Japan. Now we are pleased to offer November issue of EBM+, says Editor in Chief Pasi Salmela. On the November issue we meet the real globetrotter Italian Alessandro Maestri and Czech softball legend Patrik Kolkus. We take a closer look at WBSC Premier12 and visit Japan, Ukraine and Sweden. Last but not least we introduce two Dutch teams that have joined the Euro Baseball League, ELB. Download the magazine on App Store or Google Play in Nystig+ application. Download Nystig+ and experience the EBM+ on your mobile and/or tablet device. Please visit our website www.ebmplus.one and follow us on Facebook, Twitter and Instragram.